Sometimes the best strategy when it comes to bidding on an eBay auction is to do nothing at first. 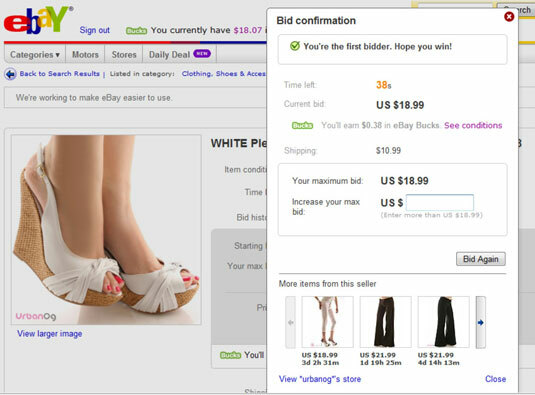 During the first six days of a week-long eBay auction you want to bid on, mark the page to watch in your My eBay area and check in every day to keep tabs on the items you’re watching and revise your strategy (or maximum bid) as the eBay auction proceeds. You may want to make a token bid (the very lowest you are allowed). Why? Because if an auction has received no bids, the seller has the right to up the minimum bid up to 12 hours before the auction ends. A seller may choose to up the minimum bid to protect his sale. By placing a minimum token bid when you first see the auction, you can foil a Buy It Now from another bidder (because Buy It Now is disabled after a bid is in place) or prevent the seller from upping the minimum. As you check back on the eBay auction each day, take a look at the other bids and the high bidder. Is someone starting a bidding war? Look at the time when the competition is bidding and note any patterns, such as lunchtime bidding. If you know what time your major competition is bidding, you can bid after he does (preferably when your foe is stuck in rush-hour traffic). During the final 24 hours of the auction, rev up your bidding strategy and decide, once and for all, whether you really have to have the item you’ve been eyeing. Maybe you put in a maximum bid of $45.02 earlier in the week. Now’s the time to decide whether you’re willing to go as high as $50.02. Maybe $56.03? No one wants to spend the day in front of the computer Just place a sticky note where you’re likely to see it (or set up an alarm on your cell phone), reminding you of the exact time the auction ends. If you’re not going to be near a computer when the auction closes, you can also use an automatic bidding software program to bid for you. When only half an hour is left before the auction ends, head for the computer and dig in for the last battle of the bidding war. The last thing you want is to get caught in Internet gridlock and not get access to the eBay Web site. Log on to eBay about 15 minutes before the auction ends. Go to the items you’re watching and click the auction title. If the auction is seeing a lot of action, when it has about 10 minutes to go, click the Refresh button on the listing page every 30 seconds to get the most current info on how many people are bidding. After you place your bid, you see a confirmation.